The five-year agreement will see Boeing join Mubadala’s existing R&D ecosystem in Abu Dhabi, including the Aerospace Research and Innovation Centre (ARIC) at Khalifa University and the Masdar Institute of Science and Technology. 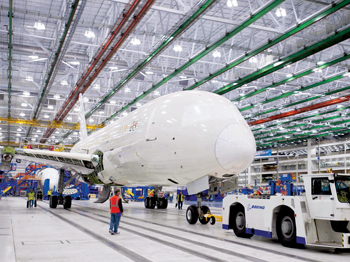 Initial projects include research in the areas of robotics and aircraft assembly while future projects will align with ongoing work in the UAE to provide the most value for Boeing, Mubadala and its wholly-owned subsidiary, Strata Manufacturing, the advanced composite aerostructures manufacturer based in Al Ain. “Today’s agreement strengthens our longstanding relationship with Boeing, and provides a platform for continued innovation,” said Homaid Al Shemmari, chief executive officer, Aerospace & Engineering Services, Mubadala. Building on the two companies’ strategic framework signed in Dubai in 2013, the R&D agreement will support the technology and capability roadmap of Strata, building on its vision to become a leading global aerospace supplier. R&D projects underway include robotic automation technologies in the manufacturing and assembly of large composite structures such as ailerons and Vertical Tail Planes (VTPs). Meanwhile, Mubadala is open to selling its aviation services unit SR Technics, an executive at the company has said confirming a previous media report. SR Technics provides technical solutions for airlines worldwide. Its services are provided either directly to the airline or through other parties such as aircraft leasing companies, OEMs (Original Equipment Manufacturers) or component trading companies. The company offers services for Airbus and Boeing aircraft and their associated engines and components and is one of the largest independent providers of these services in the world. “If someone comes for a prime price we will sell,” Al Shemmari told Reuters at a finance event in Abu Dhabi, though no-one had yet approached Mubadala to buy the unit. State-linked funds in the region have come under pressure as low oil prices prompt governments to tighten their spending and investment plans. Mubadala was considering the sale of SR Technics and held talks with bankers about the matter, Bloomberg reported in February, citing sources familiar with the matter. Mubadala had initially acquired a 40 per cent stake SR Technics in 2006 as part of a $1.3 billion takeover of the company, which was hived off from Swiss Air. Dubai Aerospace Enterprise and Dubai investment firm Istithmar each acquired a 30 per cent shareholding as part of the deal. In 2009, Mubadala acquired the stake held by Istithmar and in 2011 it became sole owner of the company. SR Technics has its headquarters in Kloten, Switzerland.